Born Free has launched a campaign calling for a phase out of elephants from UK zoos, in light of continued concerns about elephant welfare and shortened lifespan. Born Free, which was originally founded as Zoo Check in 1984 after the death of a wild-caught African elephant named Pole Pole, is concerned the needs of elephants cannot be met in a zoo environment. And it seems that the UK public also has concerns, with a new survey, carried out by Ipsos Mori on behalf of Born Free, indicating that more than half (56%) of those polled think elephants should not be kept in zoos in the UK. In 1984, there were 20 zoos in the UK keeping around 50 elephants, of which 44 had been taken from the wild. Today, 35 years later, there are 52 elephants in 12 zoos across the UK. Now, Born Free is calling for there to be no elephants in UK zoos within the next 35 years. Elephants in captivity risk dying younger than their wild counterparts: for example, for those African elephants present in the UK in 1984 who have since died, more than half did not reach 20 years old. In protected areas in the wild, at least half of African elephants might be expected to live to 56 years old or more. • Elephant endotheliotropic herpesvirus, the biggest killer of young elephants in captivity. • Abnormal behaviour, such as repetitive stereotypic swaying or pacing which is still seen in UK zoos. • Restricted space in relatively tiny enclosures lacking complexity, resulting in reduced activity and subsequent obesity and foot and joint problems. • The cold climate of the UK compared to elephants’ natural habitat in Africa and Asia. • Unnatural groupings of small numbers of unrelated elephants, and in some cases elephants kept alone, isolated from contact with members of their species. • Frequent transfers of individual elephants between zoos and separation from social groups, despite a need for stable life in family herds. As if the plight of a zoo elephant were not sad enough, some UK zoos continue to permit their keepers to handle elephants using an ankus, or bullhook. This hook-ended tool is often referred to as a guide, but is used to tap, pull or even hit elephants to control their movements. 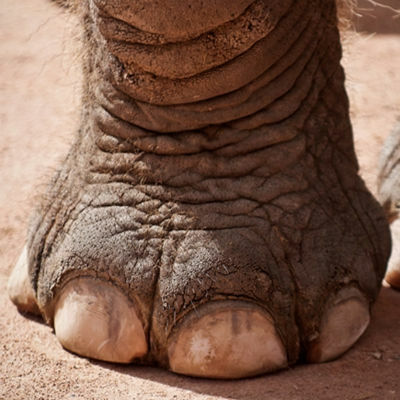 In order for this implement to be effective, elephants will be aware of its ability to cause pain. Born Free’s survey also found more than three quarters (78%) of people polled, after being shown a photo of some examples of bullhooks, believed the use of this implement is unacceptable. Born Free aims to phase out the keeping of elephants in UK zoos over time. In order to make this a reality, we are calling for an end to the import of elephants to the UK and a moratorium on the breeding of elephants in zoos.